স্টেটমেন্ট/বিবৃতি = "SELECT * FROM users WHERE name = '" + userName + "';"
statement := "SELECT * FROM userinfo WHERE id =" + a_variable + ";"
১১ এপ্রিল, ২০১১, Barracuda নেটওয়ার্ক একটি SQL ইনজেকশন ত্রুটি ব্যবহার করে আপোস করা হয়েছিল। তথ্যের মধ্যে ইমেল ঠিকানা এবং কর্মচারীদের ব্যবহারকারী নাম ছিল।. ↑ Microsoft। "SQL Injection"। সংগ্রহের তারিখ ২০১৩-০৮-০৪। SQL injection is an attack in which malicious code is inserted into strings that are later passed to an instance of SQL Server for parsing and execution. 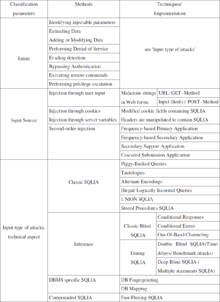 Any procedure that constructs SQL statements should be reviewed for injection vulnerabilities because SQLi Server will execute all syntactically valid queries that it receives. Even parameterized data can be manipulated by a skilled and determined attacker. ↑ Imperva (জুলাই ২০১২)। "Imperva Web Application Attack Report" (PDF)। সংগ্রহের তারিখ ২০১৩-০৮-০৪। Retailers suffer 2x as many SQL injection attacks as other industries. / While most web applications receive 4 or more web attack campaigns per month, some websites are constantly under attack. / One observed website was under attack 176 out of 180 days, or 98% of the time. ↑ Nicole Perlroth. Russian Gang Amasses Over a Billion Internet Passwords, The New York Times, August 5, 2014. এসকিউএল ইনজেকশন জ্ঞান ভাণ্ডার, ওয়েবসেক দ্বারা.